When we first moved to Catalonia, we had never visited before and knew practically nothing about any of the places. Like most people our impression was much more of coming to Spain, than coming to Catalonia. We started in Barcelona and the first year we were here, we took a holiday up in Val Repos - a meandering urbanisation just outside Romanya de la Selva. Our impression from a few summer days was that the Gaverres was hot, arid and easy to get lost. Now we've been here a while, it is true that in the heat of summer, the Gavarres can see an unbroken stretch of cork trees and dusty roads, but there is a lot more to explore and particularly in the wetter months, the Gaverres becomes a great playground of muddy tracks and hidden views. The Gavarres are also surprising because of how quickly the landscape and terrain changes. At the lower levels of the hills at the bottom of the valleys, it's common to find meadows, streams and fields and farmhouses. As the path rises through the valley it typically gets a little steeper, then turns a corner and suddenly you're in unbroken woods with stones and rocks around. Romanya de la Selva is a small hamlet with a church and some old pretty building at the top of the Gavarres with a grand vista looking out across the Vall d'Aro and a number of popular restaurants. We were a little limited for time so the walk is relatively short - a little over an hour in length (we'll come back to do more). The aim was to walk up to Puig d'En Ponç. 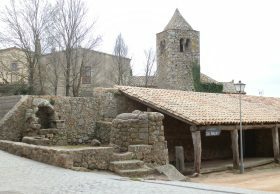 Puig means hill in Catalan, and Ponç (ponce) - is the name of numerous counts of Emporda (a long stream of Ponç and Hug I, II, III). The walk runs through the village past the chapel - go to the courtyard for the views. The path to the Puig is very clearly marked (yellow-white stripes) to start with on the road, then running down into the valley into the woods. The path is pleasant, but not really photogenic - wooded paths are always difficult to capture with a photo. 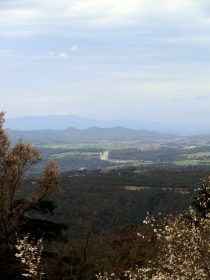 Occasionally there are views out towards Palamos and the sea in the distance. After descending for a while, the path turns back up the hillside and climbs up - for long enough to make you puff. 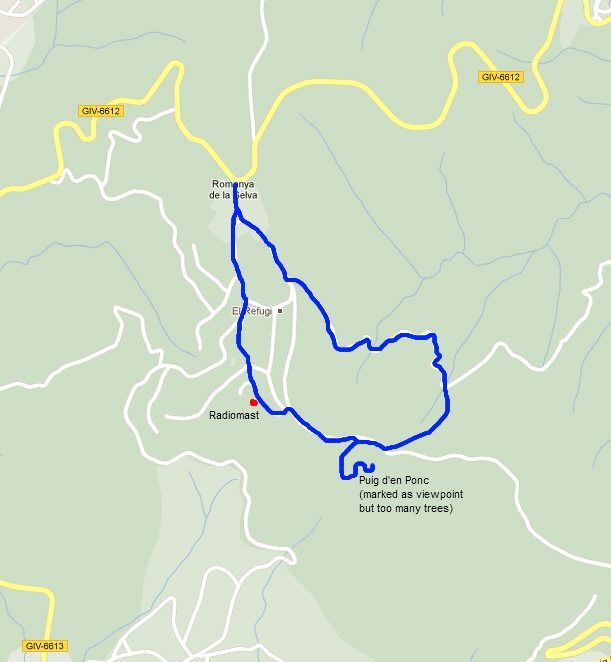 At the top it meets a road (this feels quite surprising given the feeling of remoteness in the woods. Following the path again, we go up the path to the top of the Puig. And now we're disappointed. The peak is marked as a viewpoint and it has a triangulation point on top, but though there is a clearing on top, the trees all around mean it is impossible to see anything of a view - even climbing on the triangulation point doesn't help. So we wend our way down the route we came and turn to the left down the road (very quiet). The road actually has better views than the path we were on. It runs along a ridge with views down into the wooded valley on one side, and out into the more open developed valley of St Christina d'Aro on the other side. In front of us is a radio mast and we take this road to try to get the best views. Then follow the track into the urbanisation. We get slightly stuck as it seems the only route is to go through the garden of an empty house. Then it's a simple urbanisation road back to Romanya de la Selva.